The steam locos at the quarry would have required a steady supply of coal and this would have been supplied from the mainline connection. 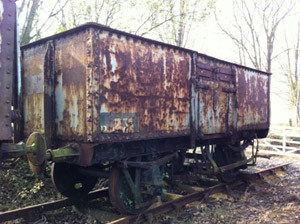 Our collection includes two now extremely rare 13-ton ex-private owner coal wagons. Built by W Rigley & Co. in 1936, as a side and bottom door mineral wagon, registered by the LMS No.172194. Built by Cambrian Wagon Co. as side, end and bottom door mineral wagon for Wm. Cory & Sons.